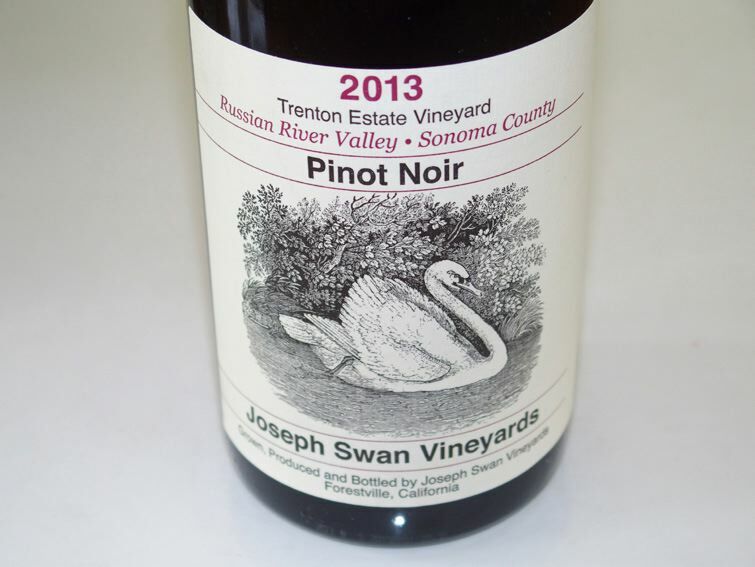 The first vintage of Joseph Swan Pinot Noir was 1973 and was produced with consultation from the legendary Andre Tchelistcheff who was a friend of Joe Swan's. 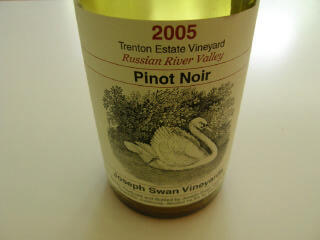 Subsequently, Swan made a string of outstanding Pinot Noirs from his vines. Despite their high quality for the time, Swan was such a perfectionist that he never was satisfied. He traveled to France every year to improve his winemaking techniques. He experimented with whole cluster fermentation, manual punch downs, and the use of new French oak barrels - all techniques that were unusual for California winemakers in the early 1970s. His legacy will include his popularization of the old, Burgundian winemaking methods, his search for better clonal material, and his openness to new idea. 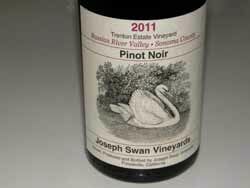 Joseph Swan passed away in 1989, but his legacy and vineyard lives on thanks to the talents of Swan’s son-in-law, Rod Berglund. Rod became a winemaker in 1979, largely due to Swan’s encouragement. Rod married Swan’s daughter, Lynn, in 1986 and help Swan with his last harvest in 1987. He has taken over management and winemaking at Joseph Swan Vineyards and has continued the tradition of excellence that Joseph Swan was known for. 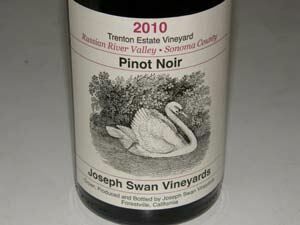 2009 marked 30 vintages for Berglund, the last 21 of which have been at Joseph Swan Vineyards. The personification of Joe has been retained in the winery’s wine club which is called “Joe’s Drinking Buddies.” Rod has continued Joe’s espirit de core by maintaining the philosophy that “While consumers are demanding that wines deliver flavor, there seems to be a growing number of people who are embracing the concept of wines with food, who understand what it takes for wines to age gracefully, and who are looking for elegance and complexity instead of sheer power. The age of chocolate and vanilla may be coming to an end! Hurray for 57 flavors! It is a thrilling time to be a wine." Joseph Swan's wife, June, passed away in January, 2010. She had retired from active involvement in the winery she co-founded back in 1969. Her car license plate was SWANPNO. 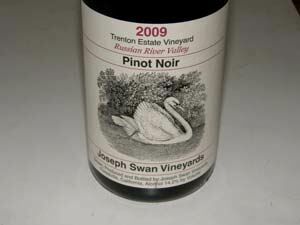 Rod crafts four consistently fine Pinot Noirs: Cuvee de Trois, Saralee's Vineyard, Trenton View Vineyard (young vines) and Trenton Estate Vineyard (the Joseph Swan estate vineyard). 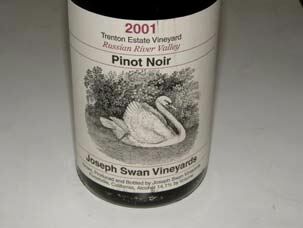 The 2006 vintage from the Trenton Estate Vineyard was the 34th commercial release from these vines. Cuvee de Trois was launched in 1999 as a blend of excess grapes from three vineyards. Today, it accounts for 40 percent of the winery's production. Small lots of several other varietals are produced including old-vine Zinfandel, Pinot Gris and Chardonnay. 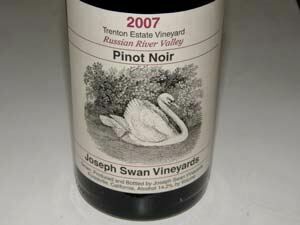 The winery's Trenton Estate includes some of the oldest Pinot Noir vines in the Russian River Valley. Yields are very low which in part accounts for character of the wines from this vineyard. It is planted largely to the Swan clone, more correctly referred to as the Swan selection. A portion of the newer block planted in 1996 contains six Dijon clones. Most of the wines are sold through a mailing list with some retail distribution. The tasting room is open on weekends (check website for directions). Tasting and sales are also offered by appointment on Mondays and Fridays (707-573-3747).